How to Keep Your Home Safe Protected While on Vacation? #1 How to Keep Your Home Safe Protected While on Vacation? It is not uncommon for people to become stressed out for the holiday season, but a vacation should be a time that allows you to relax and clear your mind. With most of our valuables locked up in safes, it can become harder to not be stressed out and the rising rate of crime all over the world does not make this easier. There are certainly a few ways for you to reduce the risk posed to your safe and valuables and these can be costly, but I like to let you know the most affordable methods that allow you to keep your safe secured during the holiday season. Keeping your home safe protected is something that needs to be considered throughout the year and not only when on holiday and these 7 tips will help you improve the overall security of your safe and even help keep that office and vacation home safes secured when you are not present. So what are these tips and how can they benefit you from a vacation standpoint? Criminals tend to befriend people under fake names to try and gain information on the person and to see if they leave any information that might be advantageous to them. If you manage to keep all your travel plans offline, you should be able to boost the anonymity of your travels and thus the intruders will not have any knowledge that the home is empty. This method will not cost you anything and when you start making this a habit, your overall home security will be improved when you go on vacation. We all know how bold intruders can be and that they are even willing to try and steal your things when you are at home. By faking that you are not away, the intruder will need to do more research and recon to see if you are home and by the time they figure out that you are gone, it might be too late and then you are back. Automatic light timers will be great and they will also symbolize the illusion that somebody is still home. This could dissuade intruders from taking a chance and they will rather move on. 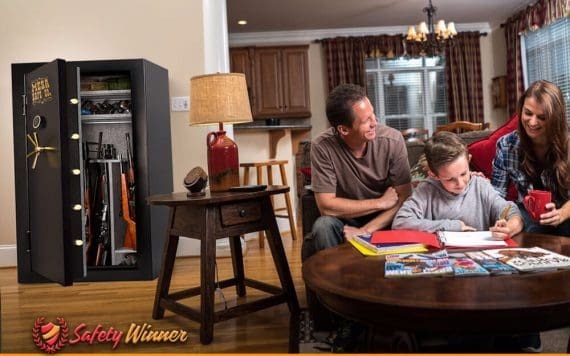 When intruders enter your home, they generally have a few spots they search first, but if the safe is concealed in a secret place, they might not be able to find the safe and in return, they will also be more likely to trigger an alarm or simply just move on and consider the house to be a bust. If you have a home security system with a silent alarm, it will also give the security company more time to try and locate the intruders and perhaps catch them red handed. While not everyone has the finances to do this, it could really make life much easier for you and you will be able to carry some of your valuable with you. The safe does not necessarily need to be small and those bigger trunk safes can also work perfectly for carrying your weapons, but I do not recommend carrying your entire arsenal of weapons with you as this might make you a target. Motion detectors can do wonders when it comes to the outdoor areas of your house, but the problem is that they can be seen and intruders will be able to prepare accordingly to try and avoid or disable them. By adding one or two of them in your house and even close to the areas where you close your safe, you will be able to alert the security company from the inside of your home and this will catch the intruders off-guard. If you manage to install silent alarms, it could also allow authorities to catch them red handed. Intruders will try to be quick during the holiday season and this is due to the fact that they will try and target multiple places and they know that authorities are more alert. By having your safe securely mounted, you will force the intruder to try and pry open the safe and this could cause them to take longer and cause more noise. Having a securely mounted safe is beneficial throughout the year and it also offers another layer of protection to your home. Nothing will improve your confidence more than knowing you have a high-quality safe. Should you decide to purchase a higher quality safe, you will have much more peace of mind and not even the elements will be able to break your safe. I always recommend the SentrySafe Company when it comes to high-quality safes and you can check out a few of our safes from them to help put your mind at ease. By following these tips, you should be able to relax and enjoy the holiday season without any break in fears and if they break in, you will know that they cannot steal the safe. I hope that you are now able to keep your home and safes secure for the holiday season. I will be happy if you let us know about your holiday safe tips and how you keep your home and safes secure from intruders. Also I would like anyone with experience to let me know what kept your safe secure from the intruders.